Most of you came from Microsoft Windows to Apple Mac OSX. And, I was one of them suffered from something different from MS Windows platforms. So, I'd like to share some hint & tips from now on. Click Finder then Preferences. Next Click General, then you can click the items : HDD, External Disk or Servers connected. And, you can configure Finder to open new folder always. We used to use the central button of mouse to scroll up and down. However, scroll direction is opposite in Mac vs. MS Windows. So, I use Scroll Reverser App & start automatically when Mac OSX starting. 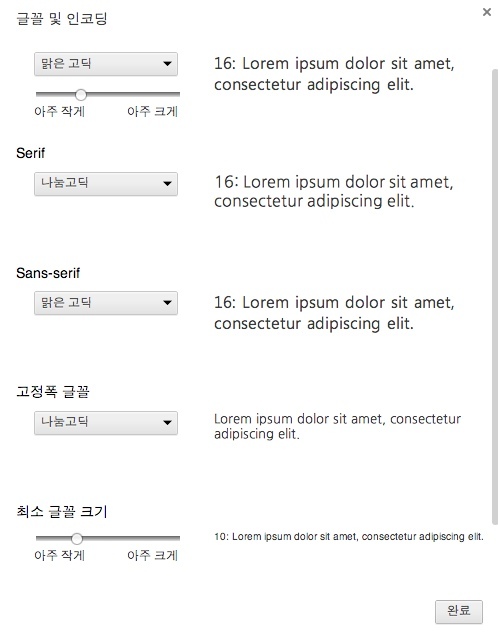 One of inhibitors to migrate from Microsoft Windows to Mac OSX is how-to toggle between your native language like Korean, Japanese and English on keyboard. As a Korean language user, I used to use Kor/Eng toggle key next to space bar usually, but it doesn't work on Mac OSX and I have to press two keys at the same time. 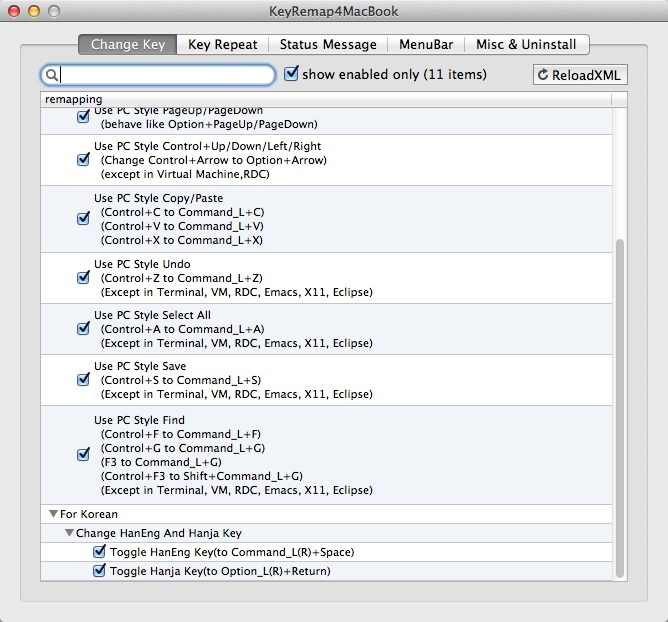 Here is the solution: you can change key after install & reboot "KeyRemap4MacBook" in System setting icon. 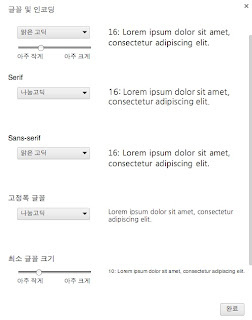 Click it and scroll down to find "For Korean", then toggle "Toggle HanEng Key(to Command_L(R)+Space), and close it. Then, it works! Actually, I hate to use any app related with keyboard with concern of hacking. But, it's known in Internet, so I'm taking the risk. 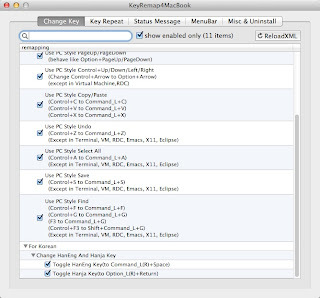 Added on 3-Oct,2013 : How to enable KOR/ENG toggle with Apple Wireless Keyboard at Right Command key - Simply move to "For Korean"-> "Make Command_R, Option_R as HanEng..." -> "Command_R to Command+Space". Done. I happen to find many new comers to Mac OSX fall in trouble to manage files like copy, move or delete. But, they may realize that Finder is a kind of Explorer in MS Windows. But, managing files in Finder or Explorer are not convenient for me. So, I recommend you to use mucommander. It's sort of Total Commander, but it's free (based on GPL). Install & put AppCleaner app on the desktop. You can drag App in Applications folder at the bottom of screen to AppCleaner to uninstall. It's simple! Many of you are Hackintosh users. Which means you may need to install any updated Kext file of Graphics, Sound or Networking Card etc. But, we have to recover the authority of that new file after copying those files, but there is no easy way to do. You can save your effort and time by using Kext Drop App. You can move this app icon from Application folder to the desktop. Then, drag and drop new Kext file to this app on the desk, then installation will be done. Simple! One of benefit of using Google Chrome is the migration of bookmark is very simple : automatically without copy those. So, I prefer to use Chrome in Mac OSX or Ubuntu too. If you still need to use Microsoft Windows OS from time to time. Virtualization is the answer to your requirement. I recommend to use VMWare Workstation to run Microsoft Windows. But, it's not free of charge at this time. It costs 249 USD as of today. Most of hackintosh users are worried about the boot failure. Timemachine feature of Mac OSX would recover with iBoot, but the perfect solution of copy the boot harddisk or clone it: Carbon Copy Cloner. You can even boot the clone image. But, you have to pay around 40 USD. I recommend you "splashtop streamer" app. It's cheap but powerful at Apple iPAD. I can connect to Mac OSX from new iPAD. But, I cannot take Mac OSX screen at retina display resolution, different from my expectation to see FullHD resolution at new iPAD which supports retina display. Sometimes, if you cannot delete files even in trash : Trash it! THIRD STEP - Log out, Log back in. This works for me. All other hint & tips of handling it at Multibeast or Chameleon wizrard didn't work for me. Strange enough, the order of disk & partition in diskutil would be different from those is Chameleon bootloader. I recommend you to follow the sequence shown at booting of Chameleon. e.g. hdd(2,1) means the third hdd (0,1,2..) & the first partition (1,2,3..). Many topics we can this by googling, but most of them are wrong to me. Just in case if you are using dual booting, you need to configure Windows support for UTC time like Linux or Mac OSX. Runregedit.exeand navigate to: HKEY_LOCAL_MACHINE\SYSTEM\CurrentControlSet\Control\TimeZoneInformation. Register New > DWORD (32-bit) Value. Name itRealTimeIsUniversal, then give it a value of 1.